Besides the aching sciatica that feels like a knife in my side and a few weeks of nagging headaches, this has been a beautiful pregnancy. In fact, I feel better and have been trying to eat more sensibly this time around then when Kenya and Chloe were in my belly. Maybe it’s the fact I have less time, so I’m trying to focus on the foods that keep me feeling active instead of weighed down. As my weakness is and will always be ice cream, I’ve tried to find a healthy, creamy treat this time around so that I don’t eat the real stuff all day long (which I would happily do given half the chance). 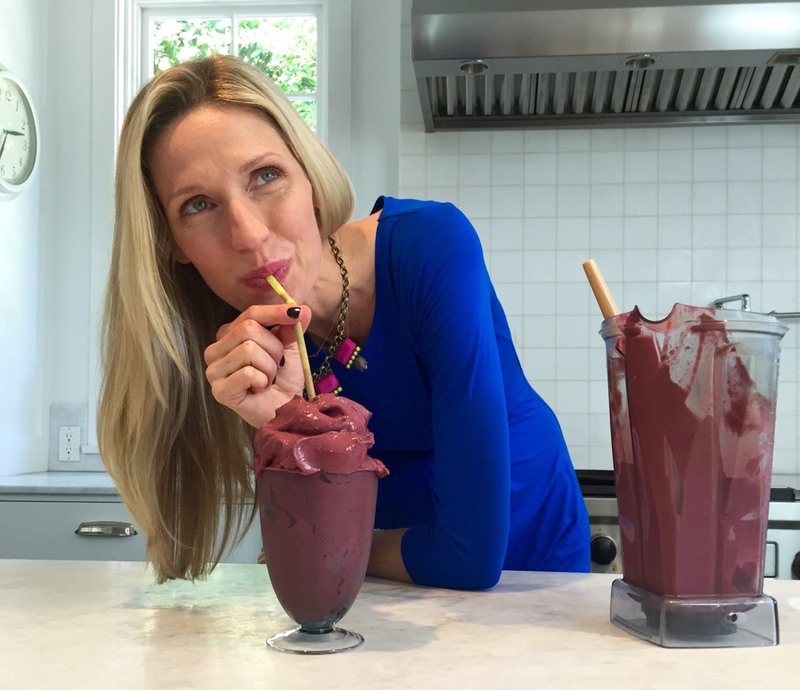 Watch this Pregnancy Smoothie video to see how I whip up my once a day nutrient packed treat. It has plenty of calories to keep you going, but is made with plenty of protein, nutrient packed extras and naturally sweet fruits. 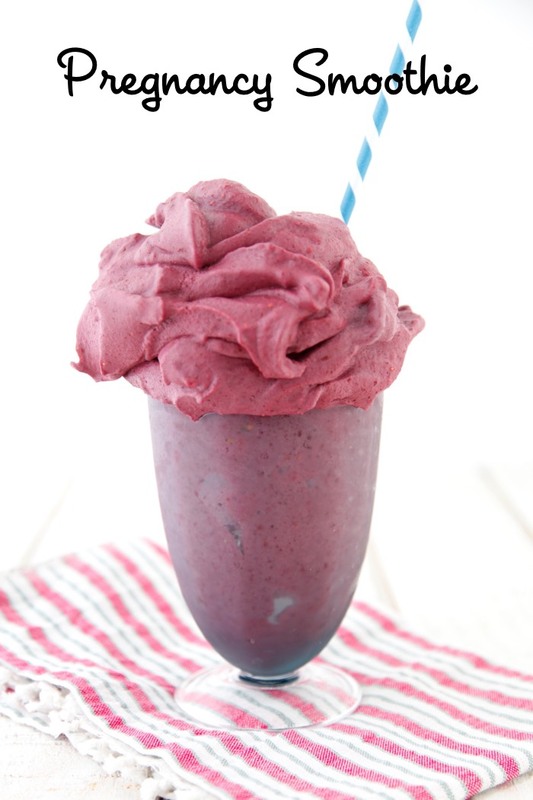 At the beginning of my pregnancy when my midwife kept telling me I needed to eat more protein to get the headaches to subside I started making this luscious treat. As another horrible side-effect of pregnancy can be constipation I can just tell you that raspberries have more fiber ounce per ounce then other foods, so you’ll be totally good to go in that department. If you’re deciding to nurse your baby, you’ll need more calories and liquid then you may have even needed when you were pregnant making this the perfect cure all aiding milk production. 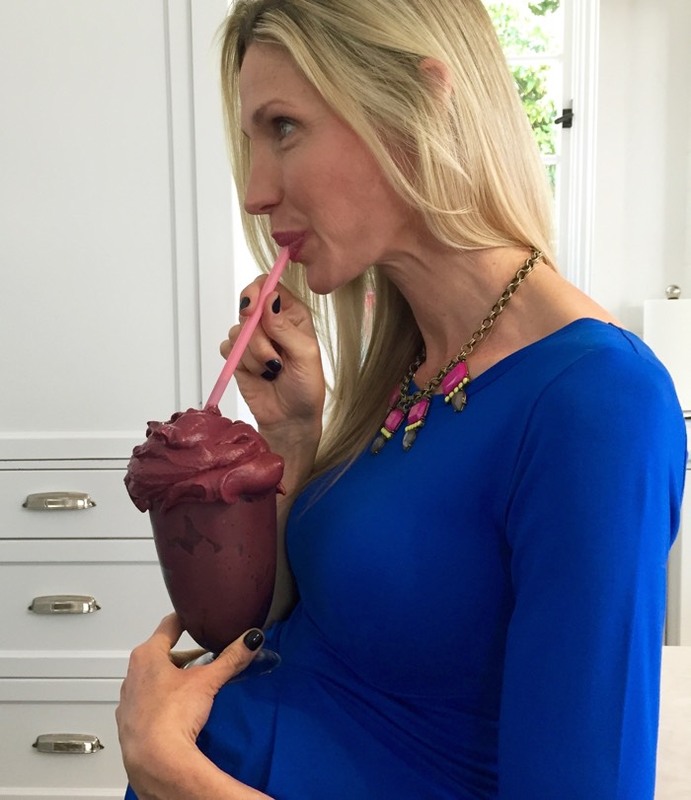 Watch this Pregnancy Smoothie Video to see the tools and foods I use to make my favorite treat these days and don’t worry.. You don’t have to be pregnant to watch to enjoy one! Wow! I'm not pregnant but am enjoying this anyway. This is the best smoothie I have ever had- maybe because it is partially frozen. I know now that I like them better frozen. Seems more like a dessert. I love sugar and eat way too much of it, but this is sweet naturally. I'm trying to find more natural options and this is something new. Thank you so much! Totally not a cooking question but my kid would love that necklace!! Where is it from? Thanks! It's been a while since I last checked in; I didn't know you were expecting #3. Congratulations! Oh my... That smoothie looks amazing and congrats on ur 3rd little bundle of joy! !